Last summer we were visiting a local artist coop’s Gallery at St Bernard Church here in Digby County and this is where we met Demeter. Do google” Demeter Goddess of Agriculture” to learn about this particular Goddess and the rest of her godly family. Our Biodynamic Beekeeping certification comes from the certifying body, Demeter. A local stone artist had created three pieces for this art exhibit and really we were quite taken by a beautiful pumpkin-sized tomato when we noticed in the corner of the exhibition room, sitting on a table, a rather interesting granite form. This was one of those destiny moments where several parts of the whole come together to create a story. The origins of this lovely Goddess- of -Agriculture captured in stone was that the sculptor, Mark Graff, had a huge stone sitting in the middle of his tomato patch and every year his rototiller and the stone “met” each other on several occasions. Apparently last year he and the stone finally communicated and he pulled the huge granite out of the ground and the stone revealed to him the hidden Goddess of Agriculture, namely Demeter, hiding within it , right down to her hair of cornrows ! It was really love at first site when we met this lovely goddess and Mark kindly escorted her to our home where she now sits on top of one of Klaus’ top bar hives, doing what comes natural to Goddesses. We celebrated our obtaining our Demeter Biodynamic Beepkeeping Certification for 2018 with “Demeter” this year — she did her part on the joyous occasion by blessing the bees and the hives and the land! ecological considerations. There are many Human Beings today who wish to be involved in being a Keeper of Bees. They want to help the bees. They are excited to connect with nature in a real way. All of this good Intention warms the Heart and affirms the shift of values and focus to a New Earth paradigm. Breaking the addiction to consumerism is one of the signs of Freedom that everyone feels as they refuse to play the binary-robotic role within a dehumanizing and mechanized old paradigm. It is not unusual for people to want to reflect the good and caring Human Values that they have within themselves by manifesting, in a real way, the goodwill which they hold . So taking care of honey bees and learning about nature is a choice that is being made by many and the first thing one has to consider is how do I learn about taking care of honey bees and where do I obtain my first hive. You probably can see the Geography of Consumerism looming ahead in the first foot forward on this journey of wishing to be a Beekeeper. The equipment sold, the usual courses given, the local advice of a beekeeper, the books you may read and pretty well most things to do with beekeeping will, for the most part, be determined by the honey-factory model, so where does one begin? 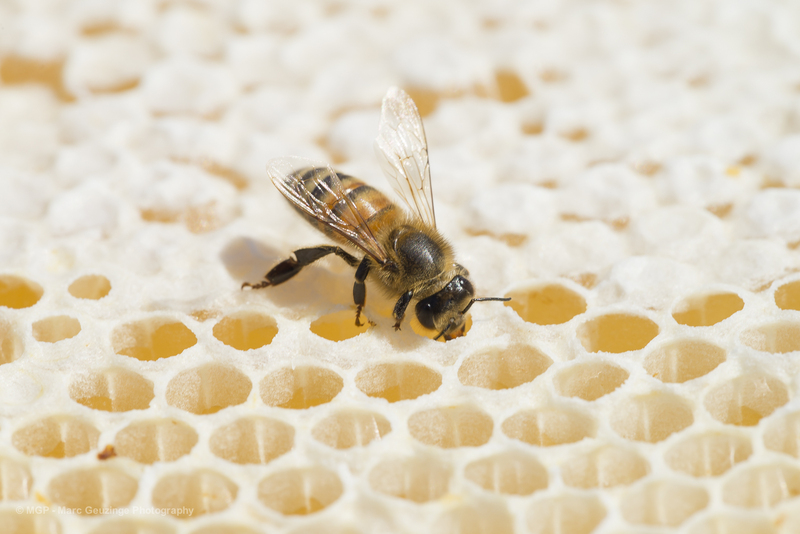 Let’s explore together this important question of Purchasing Honey Bees and Hives and some of the ethical and ecological considerations and questions posed. Spring is the time when all to- be- Keepers of Bees start their journey of questing for bees for the first time in order to start the adventure of becoming a Keeper of Bees. In today’s world, where everything seemingly can be purchased with the click of a button, why should it be any different for your new hive? Commercial bee operations will look at their winter losses from last year and will already have ordered their replacement bees from other countries or if possible, they will have simply split every hive which is worth splitting by inserting “spare” Queens from elsewhere,…….. and viola they have their numbers of hives back again. From a biodynamic perspective the picture of how to do beekeeping is not so much focused on the industrial enslavement model, where everything is about time and money, but rather where all thoughts are centered around an approach that seeks to create Spaces that will allow all life to unfold as naturally as possible. With regard to creating new colonies there are several ways one can go about this. Naturally, we as new keepers of bees, give our stamp of approval to the method which reflects the considerations we hold most important – namely ethical, spiritual and ecological considerations. If you have ever seen honey bees in your own yard, by that I mean, apis mellifera, not bumble bees and not wild bees, then you most likely have a colony of honey bees nearby you, either from another beekeepers hive or from a feral hive of honey bees, living somewhere undetected, doing their wonderous work. Should this be the case, you may be able to attract a swarm into your bait hive of choice, that you have installed at your premises. (check our blog entry on Russian Swarm Box). Install your hive trap by mid-May with some frames in it and if you can get some old brood comb in a frame or just a junk piece of comb, place those in your bait box to create a good smell for the scout bees. If you are lucky the scout bees will inspect the new apartment -offering you have generously provided and give its approval and move the whole family to these new digs. Also applying a few drops of 100% Young Living edible essential oil of Lemongrass will greatly increase your chance of attracting the scouts and convincing them to chose your location over other sites. This method of starting beekeeping would be the most natural way, but many factors do play a great role in the bees finding you. I would suggest this method be given a try, even if you are planning to purchase your bees later in the year, just to see what happens. Through our year with the bees, by the time June comes around, the bees will have made their minds up for various reasons, to prepare for the Rebirth of their Hive. When this happens we will see the building of Queen cups and Queen cells, and a change in the behaviour of the Hive Being. After I have read the situation as good as I can, I determine whether the Hive Being in front of me is wishing to create a new hive or whether they are about to replace their mother. At that time one of our choices is to not interfere with the natural process going on in the hive and rather prepare for the hiving of the one or the several swarms which may emerge from the original hive eventually. Or I will look through the hive and remove frames with queen cells, which are almost capped and place them in special mini-hives (nucleus boxes) with ample numbers of their sister bees and food so that this small bee family can function as a normal, natural hive. These nucleus colonies will continue their daily routine until their new Queen- to- Bee hatches from her Queen Cell and goes on her mating flight . She returns as the Queen of the Hive and the Mother of all new family members to come in this hives expansion. Depending on the original Hive Beings own strength and energetic nature, I help create either one or two nucleus colonies with four frames each. After such a procedure the Mother Hive will have the same appearance as a swarmed hive will look due to the thousands of bees that have left home to live in new hives. 4. Once the Queen is mated the new hive is a True hive with all the bees related to each other and to their new Queen. 6. Energetically we have supported the bees in their going through the process of making Queen Cells and Swarm Preparations and it is an ecological call as to whether we leave the hive to swarm naturally or to help in the swarming process through the new colony creation noted above. 7. The Queen of the original hive and the new small hives is related to all the sisters and brothers of the hives including their new Queens. 8. The bees in the new small hives always have the original wax cell foundations which their family created with all of its subtly of connectedness and smell and communication. 10.Taking a beginners bee course is a pre-requisite to responsible beekeeping. You don’t buy your car before you learn to drive and it is as logical as that for why one should have a bee course first and then bees. Packaged bees are just as they sound, meaning that they are arriving in a screened box with one to three pounds of bees and an unrelated Queen Bee caged and suspended in this box, surrounded by the bees. Or as I have learned lately, they also can come in a cardboard mailing tube whereby the amount of bees seem to be reduced in numbers. When you choose a package of bees you are getting bees not attached to a comb, and therefore there will be no brood present and there will be nothing that they would consider their home body. Remember the wax foundation is the skeleton of the hive. In this version you are accepting bees which live on chemical-contaminated combs , the brood is present, and the unrelated Queen is suspended in a cage, between the frames, waiting to be released into the new colony at its new location. Nucleus colonies can come in 3, 4 or 5 frame versions depending what is offered. If you get a 5 frame version it does not necessarily mean you get more bees, but just more food stored in this version. Occasionally beekeepers will sell full hives, usually Langstroth, and in this case you will most likely get a hive of ten frames per box. Depending who is offering this hive, it can consist of either one or two boxes of bees with frames and their Queen or a new unrelated introduced Queen. For this version it would be good to have some experience as a beekeeper already, as the expansion of the hive will be strong and you will be facing many decisions which would better be made in the second year of beekeeping. When you get a small four- frame- hive you have time to observe and learn from the bees and most likely you will not have swarming the first year. You and the hive will grow together. hives rarely live through the winter , just as they would not have survived with the seller. Get it:-}! 1. Remember how we said you should take a beginners course first; well this is where the catch 22 happens. If you are not taking a Natural Beekeeping Course but the usual modern industrial farming method beekeeping course , then what you will be told as “business as normal in the bee world “will be from a window of an enslavement model. Even wonderful beekeepers who love their bees, do not know they are involved in a system of commodification of life. This has been going on for over one hundred years and so the”normal” is far from normal. The equipment you will be told to buy, the way you take care of the bees with mite strips, fuming them with acids, making money on them, etc etc. will all be presented as the norm. There is nothing normal, ethical or ecological about that type of “norm”. Nature’s Truth this bringing together of separated parts energetically and spiritually DOES NOT make a True Hive. With the packaged bees version you will have what is called Shaken Bees. 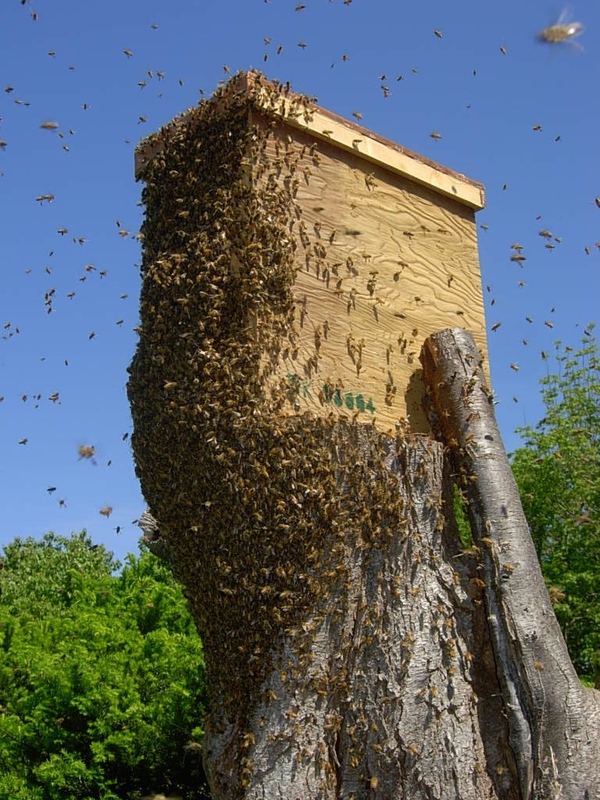 Shaken Bees means that a beekeeper will use a big funnel and will either shake the bees off of frames from one hive or several hives until the screened box is full enough to meet the appropriate “package weight” requirements. b) the Queen Bee, which is not related to these shaken bees at all, and who more than likely was shipped from another country or continent, is caged and suspended among these displaced bees with a food supply so that they will not starve to death. Often our packaged bees here come from New Zealand for example and the Queen is usually Hawaiian. These bees are displaced, not related to each other, without their real mother and from a different climate and environment and then shipped to you. c) if you have a commercial beekeeper in your area selling packaged bees the procedure is the same, less the transcontinental shipping. As you can see, there are choices you can make and sometimes availability will force upon us paths that are not perfect at all, but it is very important to be aware what you are looking at, despite the claims of the industry and it’s sales pitch. And also once you are responsible for a Hive Being , you by allowing the bees to go back to their own ways, by enhancing their life force and treating them with care and love, Nature has a wonderful way of bouncing back and wishing to dance with you, the Keeper of Bees. Remember every thought counts and every intention carried through your heart will effect all levels of life everywhere. and the fresh pollen will all be used to bring about the expansion of the hives. the bees start their housekeeping. They know it is too cool to fly far from the hive but they are Beings which live in the Present Moment and make full use of the kind warmth which the sun gives to the interior of the hive. Spring housekeeping is being done in earnest and the signs of this are all of the dead bees on the ground in front of the hives. The life span of a honey bee is not all that long and so the bees which one sees in the autumn are not necessarily the one’s one will meet and greet in the Spring. The young autumn bees, which have gained age and wisdom, just like you and I, will be the ones attending to the Queen and the community life inside . As soon as possible the dead bodies are swept out of the hive by the busy-cleaning- crew. Klaus looks at the bees on the ground to see if there are any indications of disease or something unusual to be seen. We are glad to report all seems well and all hives have survived another winter here in Nova Scotia. The newest gossip with the bees is the small shed being built in the Sanctuary to house all of the equipment and tools which are required as a keeper of bees. The former storage facility, a small yellow “bumble bee trailer”, has now found a new home as the playhouse for our granddaughter. The storing of bee equipment is no small issue. Klaus had determined the best way to keep the beautiful waxed frames which the bees had made, safe from invasion by moth’s or ants ,was to store them in our Jeep. The moth’s and ants could easily find ways into the “bumble bee trailer” and so our Jeep became a moving storage facility. most books you will read, systems and equipment you will buy and practices you will see, are all based on such a honey-factory-paradigm in beekeeping, and so it is not easy to discern what is natural and ethical and ecological. All of this and more we will discuss with you next time. We will be selling the Sanctuary’s surplus biodynamic honey at the Annapolis Royal Farmer’s Market on Saturday, Victoria Day Weekend. Hope to See you there. and a quietness once again falls onto the honey bee sanctuary. forming their rotating cosmic globe inside of their hive and enjoying the radiance of the their Queen’s light. solutions to manifest such as CSAs, biodynamic farms, biodynamic beekeeping,self-sustainable life styles, etc. It is this synergy of your Goodwill and the people ready to create new respectful and loving relationships with mankind and the earth that is indeed the Dance now happening everywhere on this earth. Thank you from the bees and us for your support in the infinite ways that your goodwill manifests. years, and like much happening these days, it is more a question of Remembering what we have forgotten. People read our label and ask “what does Demeter certified”mean or what is “biodynamic farming” and so the dialogues and the awareness grows with each conversation. With awareness comes empowerment to people to know they have choices , large and small, for entering into Life Respecting scenarios. Enough of those kind of choices by us all and we will wake up one day to a New Earth;—- one where Beauty and Love is the foundation of our daily Intentions. Summer is yummy and this year we can say it is truly an amazing year for the honey bees at the sanctuary. Not only did all of the hives survive the mild winter with good health and happiness but they were really ready for the nectar season to begin. This very strong life force which the biosphere and the cosmos is radiating forth is not only for the honey bees to be strong and healthy but also for Human Beings. Before our yearly beekeeping courses began we had three friends of ours join us at the honey bee sanctuary to meet the bees. They are triplets and three years old. You can see the little boy has his hands on his hips and surveying the whole situation —-his questions were real ones and perhaps in a couple of years Klaus will have a small apprentice to help with the bees. Notice the lack of concern about the bees flying around them – they were fearless and totally in the present moment of the discovery of Life. The lesson from the Sanctuary this time is from the baby-bee-triplets who are Love Beings too – – – Nature is a safe place —-Bees like children—–Get up close and person about looking at the miracle of nature and Ask lots, and lots and lots of Questions——–experience your inheritance of this sacred earth with inquisitiveness and joy. Celebrate nature and the Song of Summer! Greetings from Bello Uccello Honey Bee Sanctuary and the very healthy honey bees buzzing around the hives today. Our glasshouse was almost 100 degrees and windows had to be opened to deal with the heat of the sun on this February day. Every hive is buzzing and doing cleansing flights. All is well in the sanctuary this winter. We are preparing for our courses for June and we are accepting requests for information on them now. Flowers of last summer were abundant. Sometimes sitting back and contemplating on not just the details but also attempting to see the Big Picture is worthy of consideration. There were so many strange things happening in Nature last summer that we waited until we heard from many of the local beekeepers before we came to any hasty conclusions about what all of this might mean. for the honey bees. The flowers were in abundance, the sun radiated forth its life-giving nourishment and we awaited the signs from the bees to give additional Space for their anticipated expansion of their Hive. Long before mankind was involved in the bees rhythmic cycle during the “honey flow period” of the Year, this expansion cycle was happening for the honey bee and the hive. But……this year something changed. Because our relationship with the bees is one where we are observing a lot and trying to learn more about them and what they have to teach us about symbiotic relationships in nature and with Life itself; we noticed that the activity of the hive was very “internal” and that not much was happening externally. This is at a time where the bees are usually flying from the first sign of the rising sun in the morning to the last sign of the setting sun in the evening. We knew something was amiss, but logically nothing could be wrong. Finally we opened up a hive and there were the bees in the thousands and they were creating lots of brood throughout the hive and consuming the small honey stores which they had been left from the Spring. The bees were not gathering enough nectar to fill the cells in the hive to keep the Queen laying in an orderly pattern . No nectar to fill the spaces equals the Queen laying many more eggs, which will also require much more honey, which just was not there! The bees were actually on their way to starvation. Every hive had the same story to tell. So we immediately went to the deep freezer and brought out the honey of theirs which we freeze for emergencies and started feeding every hive. Now here is the funny thing – the bees were eating the honey and feeding the honey to the increasing number of baby bees but their rhythm of flying off and gathering the nectar from the plants was not really happening. How odd…………………..The Rhythm of the bees in the Hive had been disturbed by the lack of nectar in the flowers and plants. We needed to help bring back the Rhythm again. The pure honey was not doing it. It was keeping them alive and they were making brood but the Rhythm was way out of balance. Honey is not the same as Nectar to the honey bee. It became obvious to us that what the bees needed was Nectar and not honey. When they have the Nectar they will fill that watery substance in the empty cells in the hive and that will stop the overproduction of the brood and leave the bees to make the honey from the nectar and the natural ancient Rhythms and life cycles of the Hive will be Restored. Last summers bounty was amazing. Lots of pollen but no nectar. So we resorted to creating Steiner’s Bee Tea with honey rather than sugar as the substitute for the natural nectar, along with the flower essences. 10% of the sugar for this recipe should be honey or even a higher ratio if possible. We use only honey from our freezer now. can wait 20 minutes and then add the rest of the ingredients.. When the liquid completely cools it will not crystallize but be a clear liquid. It should not have crystal formations in it. The honey we had plenty of, but to obtain the high quality of essences of lemongrass, lemon, chamomile and spearmint which were 100% pure, edible and organic and which had no fillers in them was the challenge. The bees needed the Real thing. So once again the bees have given us a Life Enhancing Lesson which has benefited not only them but us and hopefully you too. We did not know that when you read a label which says 100% pure essential oil on a bottle of essential oil, the FDA requires only 5% of the contents to be the oil and the rest can be filler. The filler can be anything, including very inedible and sometimes toxic substances to our bodies and the bees bodies also. The bees needed a therapeutic , edible , organic quality of essential oils and we found them. There were two very popular companies which sold them – doTerra and Young Living. Holding our noses because of the multi-level marketing structure which one jumps through to obtain the oils, we entered 100% into the Dance with Essences .The oils had life” frequencies” which were so strong we knew the bees would be truly nourished with them and now these essences, which are the “soul of the plant”, are also part of our daily life. The frequencies of the oils are just what we needed and this is a journey we recommend highly for the happiness and well-beingness of your quality of life at this time on the planet. …. and once again it is thanks to the honey bees that this citizen medicine revelation has come into our life at this time.If you are interested is seeing what the essential oils can do for you, we recommend reading “Reference Guide for Essential Oils” by Connie and Alan Higley. What an eye opener. This is the wisdom which has been lost for a long time and it is the book which we have been looking for for decades. The bee tea was made, and within a few days the bees were back to business-as-usual and you could see that they were consuming the tea and starting to expand the hive with nectar and making honey from the nectar.. This took us through the period of no nectar in the plants. It was great when the next “honey flow ” came and the flowers actually had nectar this time. The bees were healthy, the hives were huge and life once again returned to the Rhythm of the sanctuary. QUESTION: why no nectar in the plants ? So what on earth happened? Now here is where it gets very interesting. The local small beekeepers started coming to us and talking about the same thing. Lots of pollen and lots of flowers but no nectar. This translated to them as less honey. Then came the letter from a scientist friend of ours in Ethiopia and the report on the bees there was that the flowers were plentiful but the nectar was very little. So one has to say whatever is going on looks a bit global in its nature. With the amount of proof from out-of-the-closet scientists and thousands and thousands of people, like you and me, all reporting the same thing, one can at least put the Question: Does the spraying of chemicals from the geoengineering taking place so heavily in our skies have something to do with the drying up of the nectar? It was not a lack of moisture for the flowers, nor was there a lack of flowers. Who gave whomever- it- is which is poisoning our “Commonly Owned Atmosphere” the right to bring such a death-fed of aluminum, barium, strontium etc. into the sacred cycle of life on this planet, which we are all symbiotically living within. Why is there no one stopping this? Our soil and our rivers and even the sludge from our sewer systems are all indicating elevated numbers of these toxins when they are tested. Since our country and others have signed “treaties” with each other to not create weather and/or do this geoengineering in the other country’s skies, it seems logical that perhaps this is something happening in the” here and now” of our lives. Could this explain why the trees, the plants, the animals and the bees are suffering from the “application of geoengineering of our skies”—-as well as we human beings? . What can we do to have this stopped? Can the bees continue to live a “natural cycle” when the flowers and trees are having their life essence sucked dry by the drying agents sprayed from the air ? As with all things it is good to see the government documentation where you can to confirm such questions; but also consider citizen science,which holds merit and is worthy of consideration. Since our skies continue to be geoengineered we worry about the future of the bee and again we will say – what happens to the bees is happening to us. Their fate and ours will be the same. named after our friend in Bear River where Klaus rescued a hive from his very high chimney several years ago, is worthy of a comedy play. Paul’s Rebirth of the Hive may have manifested as a new “Hippie Hive” living in a 1967 volkswagen bus, we said our goodbyes to the swarm and wished them well and left. Honey bees finding a new home in the wild is something to celebrate and so we went to town and bought ourselves an ice cream to celebrate this amazing event of the Sanctuary. On the way home we drove up to the woods to look at the swarm one more time and they had already left. Perhaps that old orange coloured Volkswagen bus with Peace written on its side was a meant-to-bee for the bees……….being Love Beings and all. Two kilometers later, as we drove down our quarter-of-a-mile long lane, Klaus saw a black thing on the side of the honey house deck. By the time we were half way down the lane we both had wild, impossible Imaginations going through our heads. Finally passion got the best of Klaus and he stopped the Jeep and ran diagonally through the fields towards the honey house. There they were —-Paul’s babies had found us! Klaus had left another two- super- bait box on the honey house deck and the bees which had left their original home located a couple of kilometers away, were now marching inside their new home very quickly. 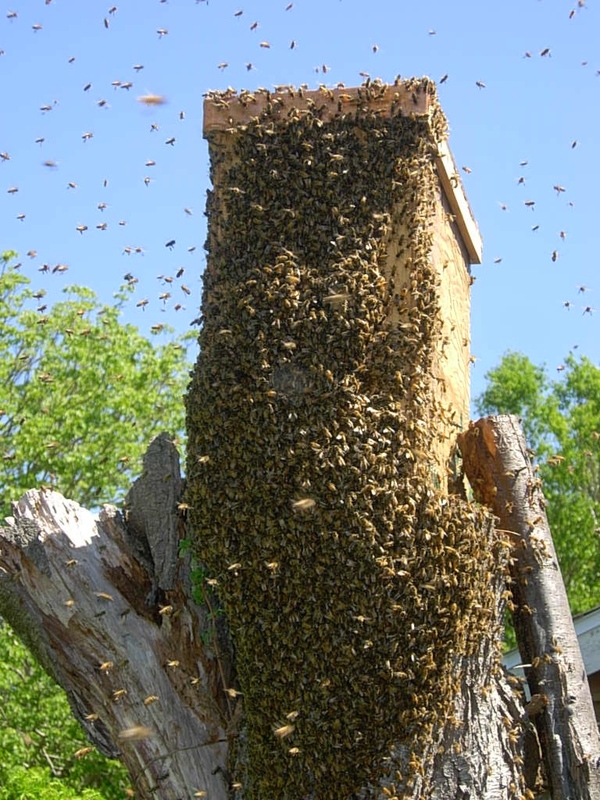 This hive became a three super hive within a week – the largest swarm yet. So the moral of the story is – just let them go and if they wish they will find you! June was a wonderful month at Bello Uccello Honey Bee Sanctuary , with two groups of absolutely wonderful people coming together, at the Sanctuary, to learn more about the hive and the bees. The bees were their usual great Teachers, Klaus was their willing and learned guide and together we all formed a positive, enthusiastic “hive of friends of the bees”, prepared to be counted as people ready to discover a New Bee Culture based on an Ethical, Spiritual and Ecological approach . What a privilege it is to meet other people who are ready, willing and able to bring their life forces and Intent to learning about the honey bee and growing their own experiences in their lives, from the lessons taught by the honey bees; one of nature’s finest Ambassadors..
Isn’t it interesting that nature Never Lies (how noble is that!) and it makes one wonder how we as sacred Human Beings have somehow found ourselves in a world where we, mostly unconsciously, participate in the enslaving, poisoning, exterminating,destroying,consuming and carrying out innumerable other acts of “separated consciousness”on the Web of Life which supports our very existence on this beautiful planet? The good news is that from our experiences lately we can see there is a huge shift taking place at this time in many arenas of life, in the warm and loving Hearts and Imaginations of mankind and every one of us can make the small choices in our daily life which supports those shifts and enlivens our lives with rich experiences and creative manifestations which all come from within ourselves. The bees are Love Beings and you can feel their basic Song of Joy though-out your whole body if you stop and listen. The honey they make can only be full of amazing life enhancing properties and happiness because the source of the honey comes from a Place of Life , just as our Dreams of Joy for mankind Imagined from our Hearts also comes from such a Place of Life. These thoughts are far from the transgenic agenda encircling our lives like the Predator Agenda it is. .
enslaved ‘manifestation’ within the Honey Factory. Thus is the plight of the honey bee today. I could go on forever with the Addiction our culture has to commodifying the “All of Life”, including Human Beings;, but there are strong hearted individuals out there serving humanity by making that phenomena very clear – check out a Waldorf teacher, named Cara St Louis and her utubes. What has happened to the bees is happening to us all, and it is when we look at the Big Picture happening to the web-of-life on this sacred planet that we can feel and see the plight of the honey bee and the hive best……and also ourselves. Bee the Change you wish to See.